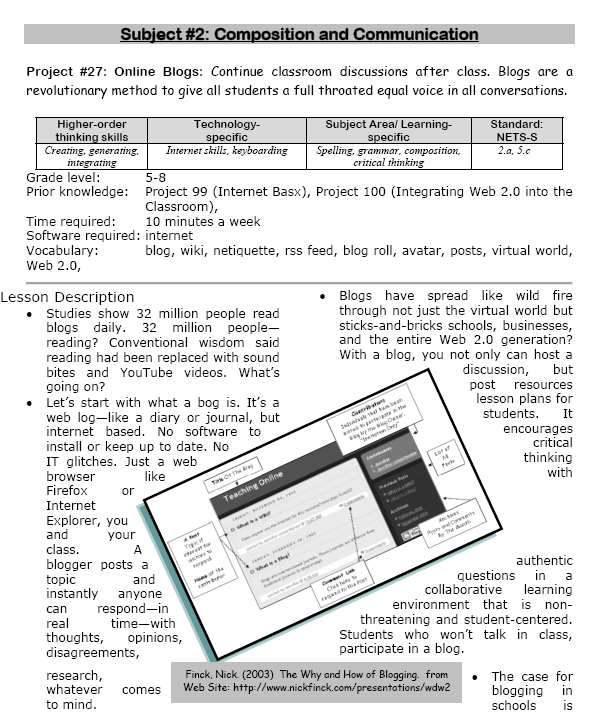 Tags: blogs, blogs in school, classroom blogs, education blogs, elementary school blogs. Bookmark the permalink. You can create a website or blog with WordPress, a free software program that’s easy to use. Hosting is inexpensive or free. One company offers free domains and unlimited sites for very little. I am initiating a blog for my students. Should I add them as blog readers or blog authors? What’s the difference? I want them to use the blog to reply to posts and to post comments. It depends if you want them to be able to post articles (that would be authors) or just respond to articles you post (that would be readers). Does that help? Blogging is a great way to teach students the art of reflection. Kudos on a great article and activity idea here. 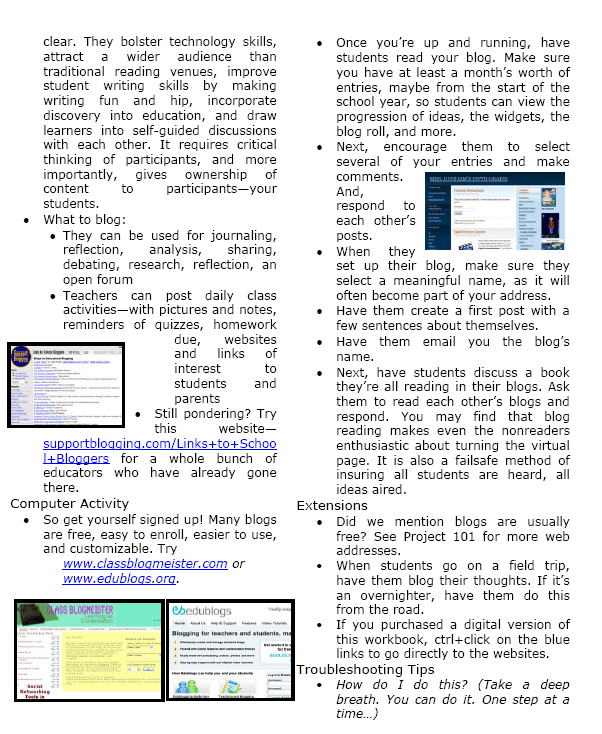 There is another really nice choice for student blogging called KidBlog. http://www.kidblog.org – It is a child/school friendly platform based upon WordPress that has an easy-to-use dashboard for teachers with school friendly settings that allow moderating before posts go live, etc. Love Kidblog–it’s my platform-of-choice with students. A bit limited for 8th graders, but hopefully by then, I’ve taught them enough about being good safe digital citizens, they can handle the adult WordPress. Jacqui, I’m curious about one aspect of blogging with students as a computer lab teacher. That aspect is efficiently managing so many students blogs. I teach grades 2 and 3 which adds up to over 600 students in 25 classes. When you only see each class once per week, blogging could easily be the basis of the entire year’s curriculum. We are a GAFE district but Blogger is blocked. For that reason and ease of management I decided upon Kidblog. So, I am curious how you manage the different classes and numbers of students as a lab teacher. Do you for example have the “all posts must be approved before going live” turned on? What is your username/password convention? Do you use the invitation method of registering student accounts or bulk upload? BTW, do you have a reference that you utilize/like in terms of the teaching progression for teaching blogging? Truth, I don’t break my students into classes. I want them to be a community, to feel free to interact with all students. I organize posts by tags, which allow students to quickly find other posts on a like topic. But, I understand with 600 students, that probably won’t work as nicely as my 100 students do (who I also see once a week). Kidblog allows you to set up multiple classes under your teacher log-in, then add students to each. That would break them into a tighter community for you. I do approve all posts before publishing, as well as comments. It doesn’t take as long as it sounds like it should (though, again, I only have about 100 4/5th grade students blogging). I added all grade-level teachers as Admins on the blog and collaborated with them to review-approve posts/comments relevant to their inquiry. This worked well as teachers started using the blog posts/comments as formative assessments, assigning topics that dealt with their inquiry. UN/PW–I keep those simple, especially important with your youngers. Since I’m approving posts/comments, there isn’t a high risk that a student will hack a classmate’s account. If they do, I’ll know who did it. Yes, there are clever ways around that, but most 2/3 graders aren’t that savvy. Once the student successfully logs on, they can change their password. I allow that, but let them know it’s their responsibility to remember. They track the myriad PWs in their binders. If they forget their PW (which they will), Admin members can reset any PW, which would be you or any of the teachers you added to the list. I do the bulk upload. No special reason, though. I am always looking for opportunities to put tech in front of students, so the invitation would work for that also. My 5th graders are on wikis and I often invite them to join (especially when they can’t find that pesky ‘join’ button!). I use blogging as an educational tech tool, not so much a skill. I show (demonstrate rather than teach) students the log-in, layout, how to add text, media, but let them do a lot of independent discovery on the richness of the platform. I post articles on my blog that, say, include YouTube videos and hope that inspires them to ask, How did you do that?. I use blogging for many Common Core standards–publishing, sharing, collaborating, understand the perspective of others, visual learning, demonstrate independence, respond to the varying demands of audience/task/purpose/discipline, comprehend as well as critique (via comments). It truly is one of those tools that fits throughout the curriculum. I wonder why your district blocks Blogger. It’s probably the ‘next’ post? there is a work-around on that which I would have to research to come up with. BTW, Charlie–I hope you don’t mind if I use your question in my Dear Otto column. You are asking exactly what so many other teachers want to know. In that column, I mention only your first name with no identifying information (unless you approve that).